Graphic Design, Painting and Photography. AJCreations is not only Commercial Design for today's fast paced world, but also the unique style of outstanding Fine Art. You will find years of freelance experience here at AJCreations in areas such as magazine publication, acrylic painting and studio photography. This site will provide the background for our business and explain the goods or services we have to offer. Our home page will highlight the most important features of both our business and our web site. We think of the home page as a kind of portal....giving customers the information they want at a glance, and offering lots of links to draw you into the rest of our world. Aligning the balance between the modern world's fast pace and yesterday's simplistic style. A different feature item will be found on this site each month. 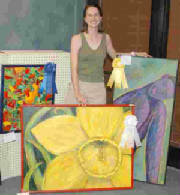 4th Annual Art's Poppin Show - FIRST PLACE in Acrylic Pepper/Garden Basket (2004); HONORABLE MENTION in Acrylic painting Buttercup (2005); THIRD PLACE in Acrylic Purple Lady (2004). Home | who? | what? | when? | & where? Notice: "Andrea J. Childress (AJCreations) recognizes the value and potential of personal publishing on the Internet, however, AJCreations cannot accept responsibility for the content of linked pages. These pages do not in any way constitute official AJCreations content. The views and opinions expressed are strictly those of the page authors, and comments on the contents of these pages should be directed to the page authors." Any pictures/images or media posted on this pages are the property of Andrea J Childress unless otherwise noted. Drop me a line and i will send you details on how to receive a full copy of the picture. At my discretion of course. This site was began in October 2002 & published in February 2004.